For the second straight practice session, Target/Chip Ganassi Racing's #9 car of Scott Dixon led the pace out front of the Indianapolis Motor Speedway. The red IndyCar on Wednesday set a fast average speed 226.971 miles per hour with a time of 39.6526 seconds. Dixon seemed rather unconcerned about his top speed in the practice but was very happy with the comfort level of his #9 car and talks about his team having "a good benchmark to start at tomorrow." After Castroneves led the first two days, the presence of Penske Racing had faded off the speed charts on Tuesday as the three-car operation placed full focus in race runs. On Wednesday's day 5 of Indy practice, Penske Racing decided to show their hand again posting the second-fast team in the session. Delivering the fast lap for the Verizon-sponsored team was Ryan Briscoe who outperformed his teammates for the first time in this month of May at Indy. "It really was a good day for the No. 6 car and for the whole team." Briscoe commented as he was joined by his fellow Penske Racing drivers in the top-8 cars of the day. Will Power furnished a 6th place run while Helio Castroneves continues to be a mainstay in the top-10 in practice, though mired in 8th spot. 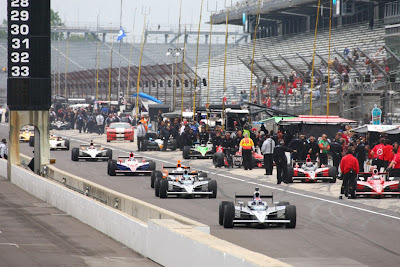 Achieving a fantastic 3rd fastest time, the FAZZT Race Team's driver Alex Tagliani described the team's work at Indy with name of a Bryan Adams album "...so far, so good". While the #77 car logged an excellent 226.002 miles per hour, Tagliani is mindful of the quickly-approaching Indy 500 Pole day. "We didn't feel like there was a point to continue today to give ourselves and idea of what the car could do for qualifying because we know that the temperature is going to be quite different on Saturday. Tomorrow is going to be a bit warmer and little bit better of a representative of what we'll see this weekend, so we'll go out and give it a shot." In another refreshing addition to the top-5 in practice on Wednesday, Hideki Mutoh stormed his #06 Newman/Haas/Lanigan Racing car into 4th quick on the session. Also a new face in the top-10 this practice was Townsend Bell. While Bell is competing in an Indy 500 only effort, it is really not a big surprise to see the American running so well. Apart from Townsend Bell beign an accomplished driver, he's driving a Sam Schmidt car co-owned by Chip Ganassi. Rounding out the top-5 was Dario Franchitti on the second Target/Chip Ganassi Racing machine who continues to show consistent speed searching long-term for a second Indy 500 victory. Hoping for his first Indy 500 win is Tony Kanaan in the #11 Andretti Autosport car. 7th fastest, Kanaan completed a dedicated 134 laps on the day setting the car up around the speedway. "... I don't think the number of laps matters; it's the quality of the runs. We felt good and kept improving. That is why we kept running." Kanaan commented in post-practice. As the only incident on the day, EJ Viso in the KV Racing Tehnology #8 car connected with the turn 1 wall. Viso is fine and was swiftly given a medical clear to return to driving duties; duties which will continue tomorrow in a backup car. Between the 35 cars clocking times on the 2.5 mile Indianapolis Motor Speedway, the difference between the fastest lap times for first to last place runners was only 1.1548 seconds. 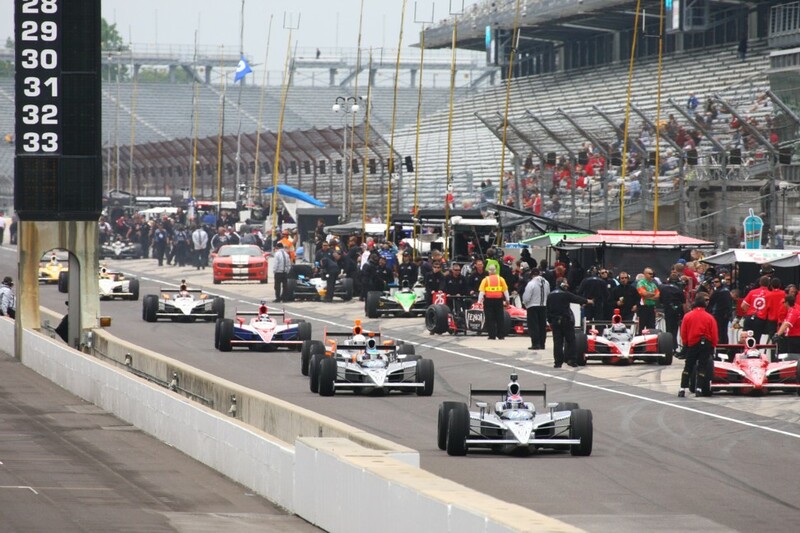 With all cars producing speeds quick enough to make last year's Indy 500, the 2010 IndyCar competition is proving tighter than previous years. Also, top speeds are roughly a mile per hour faster in 2010 with Helio Castroneves' Sunday run of over 227 miles per hour in the #3 Verizon Penske Racing Dallara-Honda.